Rustic Industrial Dining Table combines a modern edge with classic design and can be customized for size and finish. This set was designed with the intention to maximize a relatively small space. This Rustic Industrial table features a unique counter height of 37", a width of 54" to comfortably seat two diners at each end, and a length of 72", which can hold 2 chairs per side.. Supported by four substantial 4" x 2" structural steel tubes welded to a stout steel frame, the solid wood surface provides ample room to seat eight diners comfortably. Makes for an ideal gathering for drinks and hors d'oeuvres. Counter Height Tavern Bench serves as an ideal complement to this set. Spacious enough for two adults yet allows for up to three children. 46" long x 18" wide x 24" high. Wrapped in our unique channel iron frame, and fitted with a welded metal foot rest, this bench is beautiful, functional and adds a touch of old world charm. Counter Height Bar Chairs are super comfortable with flexible spring steel uprights which provide the gentle ability to rock back and forth. Our generous, oversized, solid wood seat surface is 18" squared. The seat height in this set is 2" shorter than our standard counter chairs to allow the chair back to skim the top of the table creating a low profile. The Counter Height Chairs and Benches both have foot rests 18" below the seat surface which is an industry standard, yet can be customized for your comfort. Above items are all shown in our "Pale Ale" finish but are available in the finish color of your choosing. Explore the rest of our site: view our designs and spark your imagination! We love creating new things! If you don't see exactly what you're after, no problem, simply contact Coco and Rusty to discuss options to meet your needs! 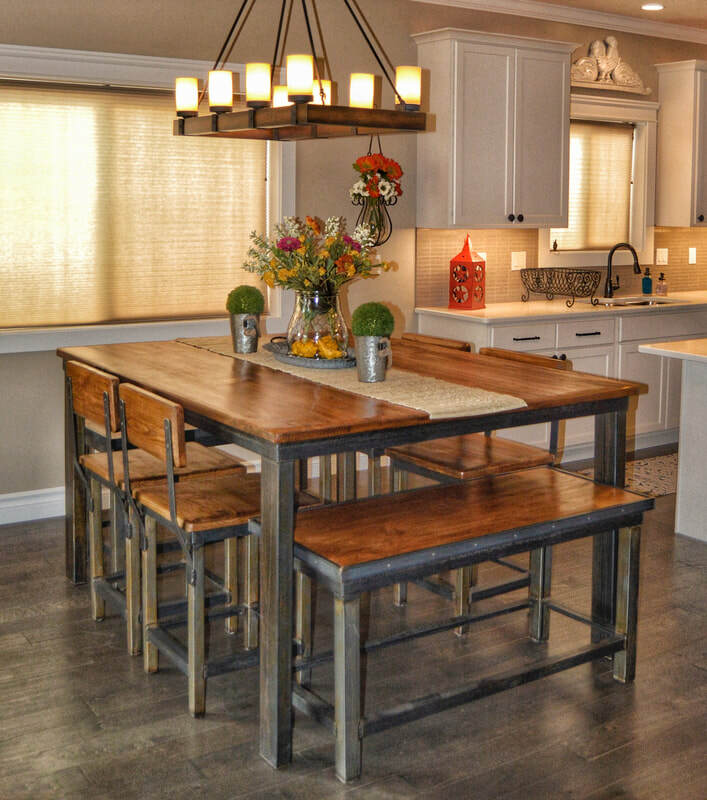 At Rustic Industrial Designs, we strive to make your home, office, bar, restaurant or hotel a place to be remembered.